PVC complies to EN71 Euro standards. PVC has UVA protection and is 250 micron thick and not 180 micron which is normally used on cheap rain covers or plastic. Our PVC is soft and supple unlike other PVCs that stick together and are difficult to unfold. Carefully designed and professionally made in our factories. Rest assured this is the best quality/value product. Features: * Elasticated to the front and the back for superb fit. * UV Protection. * Carry handle/window opening flap. * Fully ventilated with mesh on both sides. * Easy throw over design. * Designed to fit perfect. * 250 Micron thick plastic. * Crystal clear plastic for excellent visibility. * Black binding all around. * Folds compactly for storage. Care: * Once wet clean with a dry cloth, keep in open in dry airy place until dry. 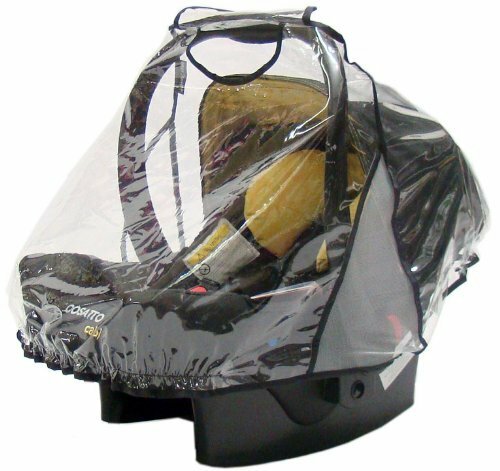 * Never leave your child unattended whilst the cover is on stroller/carseat/carrycot. * Read product instructions and keep for future reference.